Hainan Island is the smallest and southernmost province in China, comprising several islands in the South China Sea. Haikou on the northern coast is the capital of the province, while Sanya is a well-known tourist destination on the southern coast. 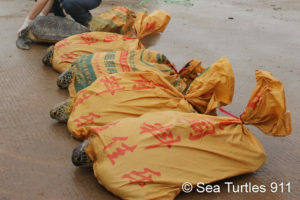 Hainan has long been renowned in the country for its natural beauty and native wildlife, earning it the nickname “the Hawaii of China.” But with sea turtle meat and shells in high demand for years across China, in the past 30 years the animals stopped coming to Hainan to lay eggs. 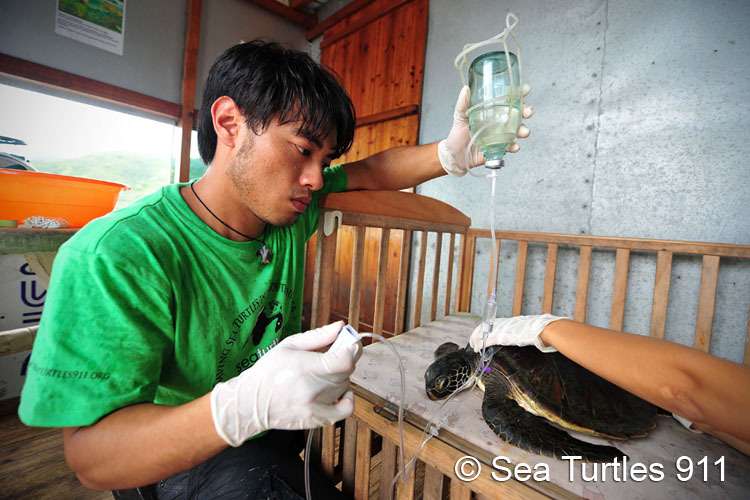 Dozens of rare and endangered sea turtles have been rehabilitated at hospitals and labs on Hainan Island, supervised by Yeh and Haitao. 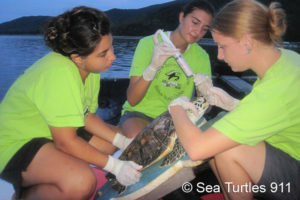 Their work in ecological restoration primarily involves the planting of sea grass beds (a favorite food of green sea turtles) in the waters around the island. 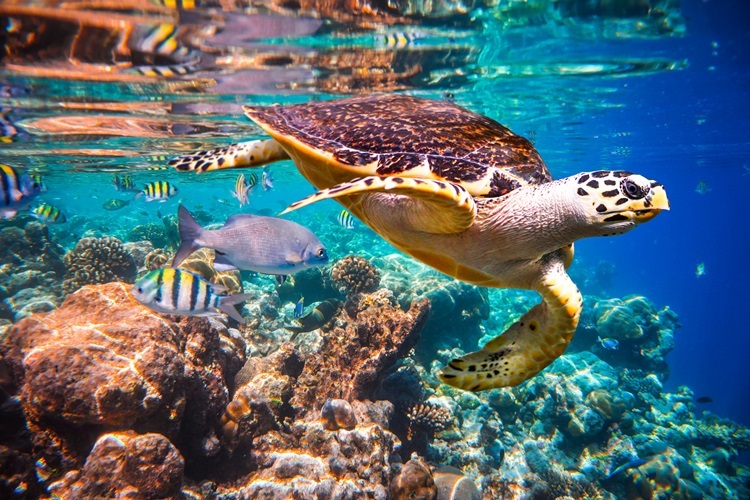 This is intended to help restore the natural balance, and help to maintain the ecosystem necessary for the sea turtles and other marine life. Only with healthy and sufficient sea grass beds can they hope the rehabilitated turtles to remain in Hainan, and start nesting there again to steadily increase the local sea turtle population over the long run. Sea Turtle 911 is also researching the sea grass, seeking ways to increase its resilience to both destructive local human activities and to global climate change. Yeh said it had been a lot of hard work to get to this point but he is hopeful his efforts will pay off. “When you see the sea turtles in Hawaii, how great they are, it’s worth it when you can envision that and hope that one day it will happen in Hainan, one day, in China,” he said. Haitao was working as a researcher in China’s remote Xinjiang province when he realized how steeply turtle and tortoise populations were going into decline. For instance, in the 1960s, there were about 15,000 Central Asian tortoises every square kilometer in some parts of Xinjiang. By the time he arrived in the 1980s, there were only six per square kilometer. Sea Turtle 911 was funded by the U.S.-China EcoPartnerships Program. Since its inception in 2008, the program has facilitated 30 partnerships that serve as models for the tangible results that can be achieved through sub-national cooperation. The State Department-sponsored EcoPartnerships program brings together experts and innovators from U.S. and Chinese cities, companies, universities, and NGOs to work together, exchange best practices, and find solutions to challenges related to environmental protection, clean energy, and climate change. Since its inception in 2008, the program has facilitated 30 partnerships that serve as models for the tangible results that can be achieved through sub-national cooperation. Sea Turtles 911 and Hainan Normal University will track sea turtle migration, help restore habitats, and foster community involvement in sea turtle protection. Boeing and the Commercial Aircraft Corporation of China will work together to demonstrate how to fuel aircraft with waste oil and enhance operating practices to reduce greenhouse gas emissions. Columbia University and Baotou Steel Group will capture iron and steel slag waste and recycle it for use in other industrial processes, preventing dangerous emissions. The University of Kentucky and Jiangsu Wisdom Engineering and Technology Company will work to reduce air pollution and sequester CO2 through more cost-effective methods in energy intensive industries. Ramboll Environ, IMACC and the Suzhou State Environmental Protection Hi-tech Industrial Park Development Company will continuously monitor air pollution near chemical industrial parks and publish the data to help protect vulnerable populations. Wilson Solarpower and the Shenzhen Enesoon Science & Technology Company will pilot an innovative solar thermal power collector to demonstrate performance and cost improvements over traditional technologies. EcoPartnerships encourage environmental action at the sub-national level, mobilizing private sector investment and leveraging capital to pursue joint projects. The program relies on strong cooperation between a Secretariat of subject matter experts, offering technical support on behalf of the U.S. and Chinese governments, and the self-financed U.S. and Chinese EcoPartners. Each dollar of U.S. government investment is leveraged by the partners. See CNN article by Ben Westcott. See Sea Turtle 911 website. See U.S.-China EcoPartnerships Program website.